The annual Rink Runner competition took place every year during the Month of Giving. It brought together Bruces from all over Neopia for a day of spirited competition. The rules of Rink Runner were seemingly simple: keep your singing in tune while you skate. And it was simple. That is, until the holes in the ice begin to show. What made Rink Runner difficult was that during the performances, random holes in the rink would show up. The objective is to be able to skate around them and still keep your tune. But the more holes that show up, the harder it is to skate around them. The game is over when the Bruce falls through the ice. Whoever lasted the longest before falling through the ice would be the winner. The winner received the elusive Ice Cup, a sparkling, tall silver trophy. The Rink Runner Competition has been taking place for as far back as anybody in Happy Valley could remember. Though it originated in Happy Valley, no Bruce from Happy Valley had won in over a century. Last year, the winner was ironically from The Lost Desert, which couldn’t get further away from the snow and ice if it tried. This year, one Bruce named Barry was hoping to change that. Barry was a young blue Bruce, around 16 years old. But he had talent. He had been playing Rink Runner since a young age. His owner would never forget seeing her Bruce on the ice for the first time – her little Bruce was skating and skirting effortlessly, a smile on his baby face. It had looked like something he war born to do, and on top of all that, he enjoyed it. At his owner’s encouragement, he began to play competitively from a young age. Back in the competition circle, Barry fidgeted with his striped red and white scarf, and pulled his earmuffs closer. But he did this not because he was cold, but because he was nervous. Even though he had been practicing for months, his confidence was not as high as he would have hoped for at the moment. In the circle, he watched the other Bruces talking to each other. They seemed so confident and at ease, smiling and laughing with each other. “Psst, hey Barry!” a voice said. Barry turned to face the voice. It was his owner. She was wearing a black furry parka, and had the fur-lined hood pulled comically high up on her face, so that all that was visible were her blue eyes. Bruce grinned; his owner, despite being a native of Happy Valley, was such a wimp about the cold. “How’s it going?” she asked eagerly. “How are you feeling? Do you want some hot chocolate?” She held a cup he hadn’t noticed previously up to him. Gratefully, he took it, taking a sip. Before Barry could answer, he heard a booming voice say, “All Bruces from the competition circle, the competition is about to begin!” He looked at his owner, who mouthed, Go! You an do it! before slinking off into the crowd. The first Bruce entered the rink. Bruce was set to go last, so he had to watch how great everybody else was before he got to go, plus he had to finish off the show, which put a lot of pressure on him. The first Bruce squandered his turn pretty poorly, falling down the first rift that appeared. The next lasted slightly longer. Bruce heard the audience politely clap for them. The further down the line the show went, the better the Bruces got. Once Bruce lasted five whole minutes on the ice, and belted out one of the most beautiful songs that Barry had ever heard. He started nervously fiddling with his scarf again as he realized he was up next. It’s said that when you are highly anticipating a fun event, time seems to go slower. It’s also said that if you are dreading an event, time moves faster than an Elephante charging for a peanut. This was true for poor Barry, who found him self being called to the ice in what felt like five seconds. Steeling himself, he stepped onto the ice. Silence. The crowd all looked at him expectantly, waiting. Panicked, Barry searched the crowd for his owner; she had promised him she would sit right at the front, and that he could look at her if he got nervous. Sure enough, he found her face. She lowered her parka hood and gave him a huge smile and thumbs up, mouthing the words You can do it, Barry! She was right. He could. He had worked for years to make it to this moment. This was his shot, and he refused to blow it. Like his owner said, he had a song inside him that was waiting to come out. He took a deep breath, opened his mouth, and began to sing as he skated. His first two or three notes were shaky, he will admit. But soon, he gained his composure, belting out clear, sharp notes that earned him cheers from the audience. The first rift in the ice appeared, and he swiftly dodged it, doing a figure eight to louder cheering. The next rift was bigger, wider. He narrowly avoided it, and his voice shook slightly. The crowd gasped. But still Barry pressed on. Eventually, he had been singing for seven whole minutes – two minutes longer than the current high scorer. For Barry, the time flew by. He was determined, focused, and eager to succeed. When he finally fell through a rift, the shock of icy water made him gasp. The noise above him sounded muted, and the world around him was murky and unclear. An attendant quickly pulled him out. He discovered that the muted noise was cheering. The crowd was cheering. And they were cheering for him. Fighting back tears, Barry was led to the top of the winner’s podium. The announcer cheerfully placed a gold medal around his neck, and presented him with the Ice Cup. It was beautiful. It was tall and gold, with a little Bruce singing music notes atop a golden, snow-covered mountain. Unable to contain his joy, Barry let out a whoop! of joy, thrusting his trophy higher in the air. He made eye contact with his owner in the crowd, and she was beaming as she clapped her hands. The cheers mounted again. Barry just stood in the glow of victory, promising to himself that he would never forget this moment. And he never did. After that day, Barry went on to become one of the most accomplished Rink Runners of all time. In the spirit of the holiday, and to make sure that every type of Neopet could experience the joy he felt from skating, Barry dedicated his life to make Rink Runner accessible to all types of Neopets, not just Bruces. 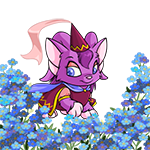 Today, Rink Runner is enjoyed by Neopets all over the world.